A Volunteer’s recent life and work in Ukraine as experienced by the author. The good stuff. The not so good. Facts and stories aplenty. Advice. Tips. 512 pages. Index. 146 photos! The writer, a journalist, fulfills his ambition to serve in Peace Corps. In struggling Ukraine, part of the old USSR. 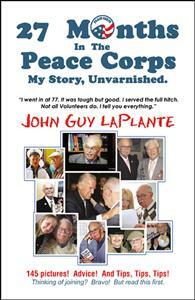 He gives an intimate report of his life and work as a Volunteer. First, getting in! Then the challenges, pay, living conditions, language problems, satisfactions, friendships, surprises, travel opportunities. Everything from A to Z.